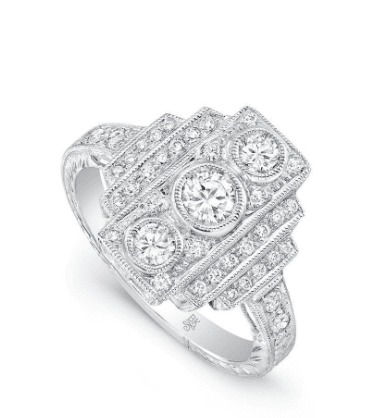 Total Carat Weight With mesmerizing presence, this vintage-style 18k white gold ring features three center mounts, tiered shoulder silhouettes, round and pavé diamonds. It’s further adorned with hand milgrain and elegant engraving. Available in: 14K or 18K White Gold, Rose Gold, Yellow Gold And Platinum.